White headband w/ stuffed white ears & a stuffed silver horn in the middle. White tail stuffed and covered w/ faux fur. Tail attaches with velcro snap. You're the perfect light shade of silver, exuding a mystical aura. Magical, sweet, and oh-so-sought-after. And no, silly, we're not talking about that Starbucks drink. We're talking about your enchanting glory and mysterious wonder. We're talking about you and your lovely silver spiral horn; the one and only mythical unicorn. This set of accessories may not grant you magical powers—heck, if you can find a headband that does so, drop us a line—but we have it on good authority that you'll look so ethereal, so full of glow and warmth and happiness, others may not believe their eyes. That, we think, makes it worth transforming into a unicorn any day! 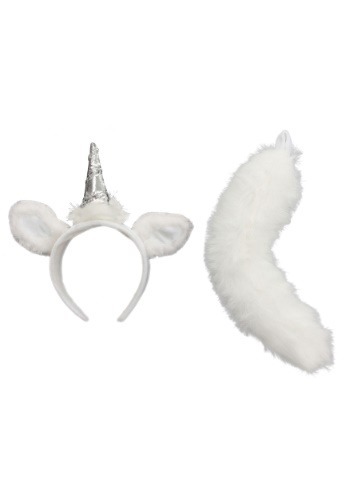 This silver-sequined Unicorn Headband and Tail will help you do just that! Just exercise caution if anyone approaches you with questions about your blood type; their intentions are likely nefarious, and you likely do not have the immortality they're after.